Can anyone think of a theme for Halloween without those creepy pumpkins engraved with big eyes and mouth? Most of my friends happen to decorate their homes the same way year after year with bulky pumpkins that are high on price during the fall. 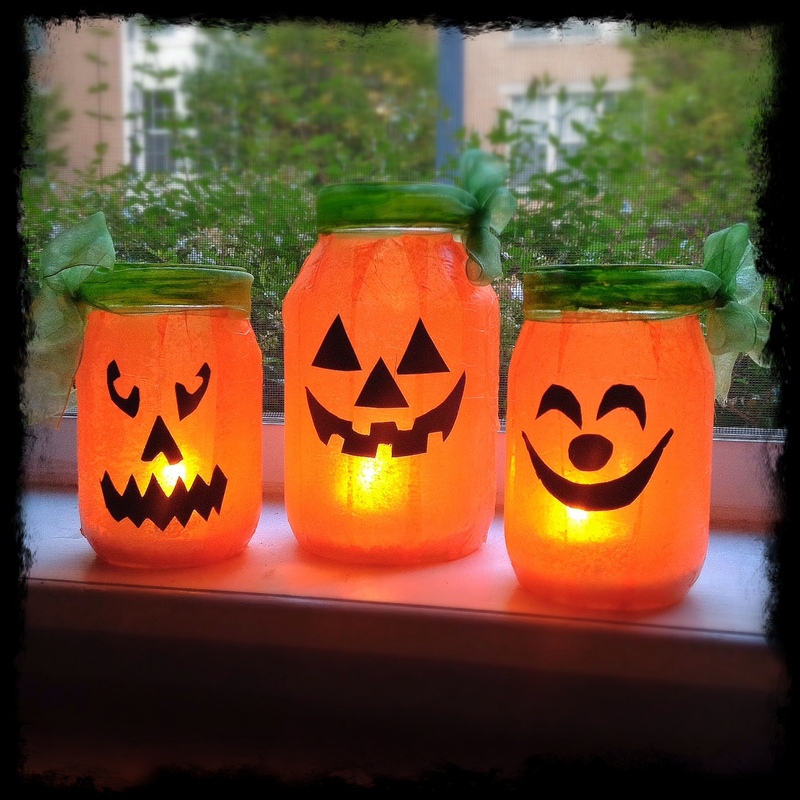 In this regard, last year I took the unconventional path courtesy Celebrations and gingered up my abode with adorable mason jar pumpkins (And it had nothing to do with Jack-o’-lantern). Cut the tissue paper into rectangular pieces of 1 to 1 ½ width. 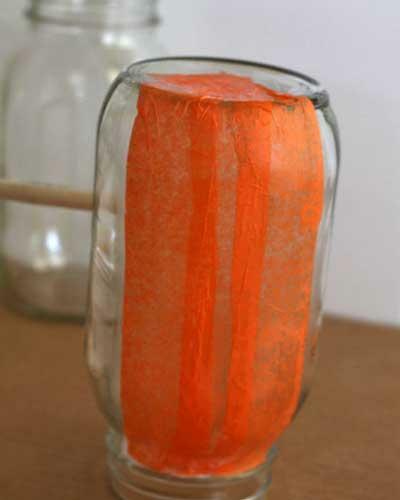 Apply the mod podge to the inside of the jar and attach the paper strips one by one starting from the mouth of the jar to the bottom till the entire jar is covered. Brush the mod podge again onto the glued tissue strips and stick the remaining strips in the same way. Turn the mason jar upside down and let it completely dry. 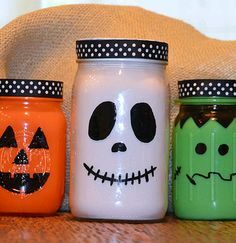 Cut out the mouth and eyes from the black paper and attach them to the outside of the jar using the glue. 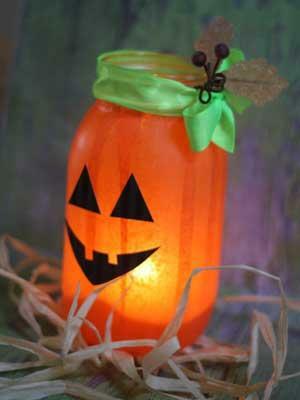 Instead of having an eerie feeling, I was in awe of the glowing mason jar pumpkin. Imagine decorating every nook and corner with these glimmering Halloween beauties. My sisters had then come over to my place later in the evening, and together we made some more of these glowing pumpkins. Don’t you love the different expressions on their faces? 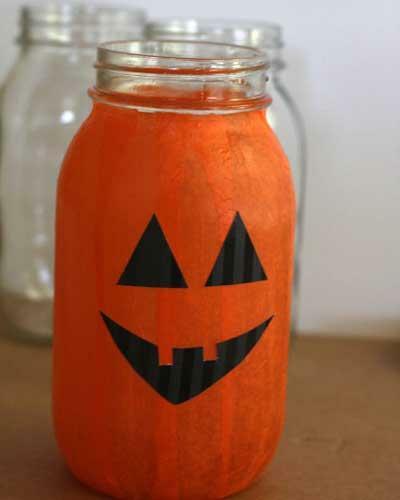 Let the jars take a backseat for a while as there is another way to recreate the luscious effect of the festive pumpkin with a bunch of mason jar lids. 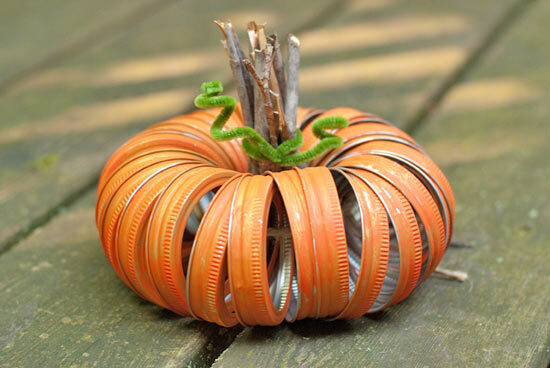 Simple and interesting, the mason jar band pumpkin is undoubtedly a treat for the eyes. Spare the icky glues and tissue papers and just dip the paintbrushes in dollops of paints to deck the mason jars. The mischievous mason jar pumpkin faces sitting on the mantel shelf are going to keep an eye on you all through the Halloween night so beware. As a part of fall décor, you can’t afford to miss this engrossing craft for your Halloween house party. If you can do the project with different sizes of mason jars, then don’t forget to share with me your creation.